Have trouble spreading wax over your car? Get a grip! Grab ahold of the Gripper Applicator System, and save your tired hands. 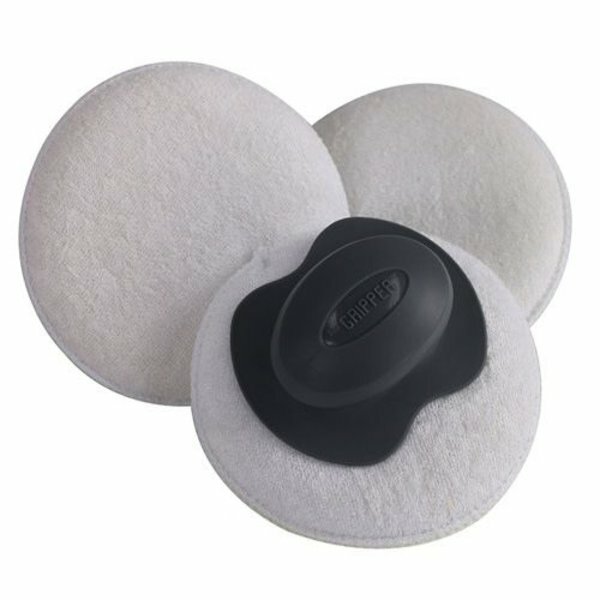 This elegant detailing solution combines an ergonomic plastic handle with 3 premium soft microfiber applicator pads. Spread your favorite paste wax, cream sealant, or tire shine dressing with one of the three included premium microfiber applicator pads. The Gripper Applicator Handle goes wherever you go. The sculpted handle fits comfortably in the hand, and reduces the effort needed and strain caused by reaching out to wax large panels like car hoods and roofs. The Gripper also reduces detailing accidents and mistakes. Professional detailers know that dropping an applicator pad is an industry no-no! Foam and microfiber pads pick up any tiny pebbles, grains of sand, dirt, and other abrasive grime once they hit the ground. The Gripper keeps the applicator in your hand, off the ground, and on the paintwork where it belongs. The unique detailing tool increases precise application and handling of your favorite car wax, glaze, or polish, so you can keep your products on the paintwork and off of plastic and rubber trim that easily stain and discolor. Spread your favorite wax on exterior paintwork, glass, and polished metals; spread your favorite tire shine dressing on tires, trim pieces, and engine bay parts; and spread your favorite leather protectant cream over seats and upholstery with the Gripper Applicator System. Throw the reusable microfiber applicator pads in the wash with your towels to keep them fresh and clean for the next wax job. The Gripper Applicator System is versatile, flexible, and increases the detailing power of any detailer, old or young. Grab the Gripper pad holder, and wax your car with minimal strain and effort. The Gripper Applicator System is the perfect tool for waxing, polishing, and shining your car. If you have trouble grabbing ahold of foam applicator discs or microfiber sponges, the Gripper takes away all the strain for trouble-free detailing. The Gripper is a sculpted plastic handle that slips right into the hand for easy spreading over paintwork. This plastic handle uses hook & loop fasteners to grab ahold of the 3 included 5-inch diameter microfiber applicator pads to keep them on your paint, and off the ground. Spread the perfect coat of your favorite carnauba paste wax, cream glaze, or synthetic sealant to keep your paintwork shining bright with the Gripper Applicator System. The Gripper Applicator comes with 3 premium microfiber applicator discs. Use one when spreading wax, glaze, or sealant over paintwork, glass, clear plastics, and polished metals. Shine up tires and restore a deep-black new look to tires, and plastic and rubber trim pieces found all over bumpers, side view mirrors, window sills, fender flares, louvers, grilles, and engine parts with another Gripper microfiber applicator and your favorite Chemical Guys dressing. Save the last Gripper microfiber disc for interior car parts, and use it to massage leather conditioner creams into seats or nourishing plastic dressing into dashboards and door panels. The possibilities are endless, and the Gripper Applicator System is the perfect tool for trouble-free detailing inside, or outside your car.